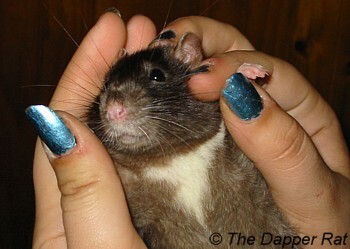 Ever wondered what colour or marking your rat is? Then here's the place to find out! 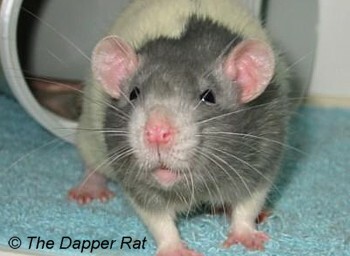 This is not an official standards page for any rat club, but rather a basic reference for the Australian pet rat owner. Here you will see photos of different colours and markings in pet rats (many are mismarked, or not perfect show rats) to give you an idea of what your rats colours and markings may be. 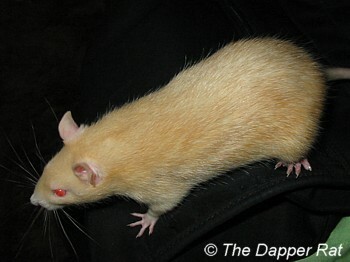 There are large variations in colours and markings in rats due to genetics, coat condition, the age of the rat, and the camera settings used in the photos. Even the names of the standards between different clubs (both in Australia and overseas) vary. So consider this webpage just a simple guide for the pet rat owner. 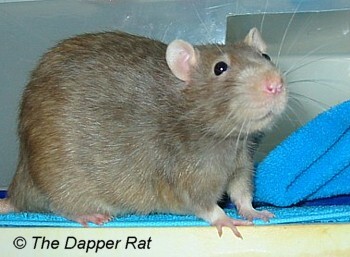 Most Australian rats have standard coats. 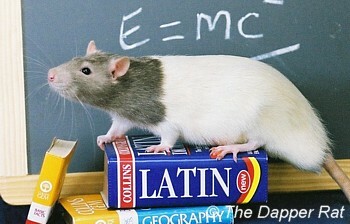 There are some rex (curly) and silky (fine and shiny) coated rats, although they are rare. There are no hairless rats in Australia. 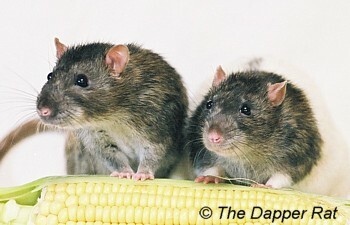 In Australia all rats have standard ears (no dumbos). There are a small number of manx (tailless) rats and also a few odd-eyed rats (two different coloured eyes). 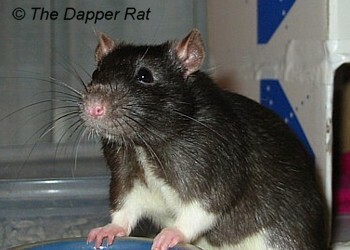 Note: More photos of each rat shown can be seen by clicking the rat's name. 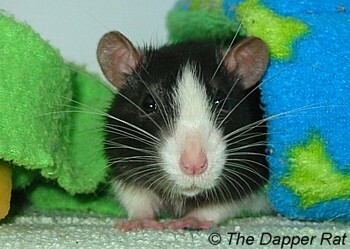 In many cases there's also links to other rats with the same markings to show you variations within the markings. The coat is all the one colour, with no white markings on the belly, feet or tail. The belly may appear lighter (due to the absence of guard hairs) but it will not have any white markings. 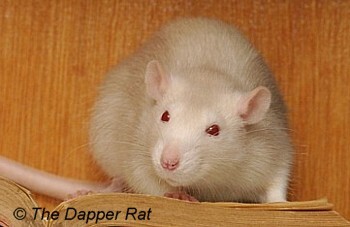 A solid coloured rat with a white triangle on the chest, and white front feet. 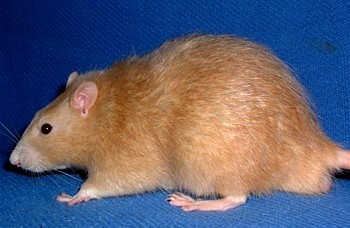 A solid coloured rat with a white belly, and usually with white feet and white tail tip. The belly marking is supposed to be wide and evenly edged, but they're usually irregular shapes. See also: Fudge (black berkshire), The Bear (agouti berkshire), Bramble (black berkshire), Stat! (cinnamon berkshire), Bokeh (dove berkshire) and Husky (champagne berkshire). 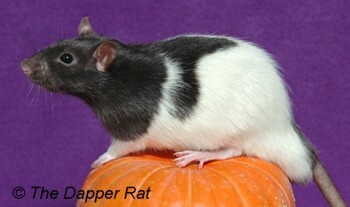 Similar to berkshire, but the white markings are very irregular and may come up the sides of the rat. Similar to berkshire, but the white markings cover the entire belly and extend down each leg. Colour on the head and shoulders, with a stripe down the back. The rest of the coat is white. They often have imperfect stripes (splotches and blow-outs) and belly spots. Colour on the head and shoulders only. Similar to the hooded, but without the stripe down the back. White marking on the face from the nose to the forehead. 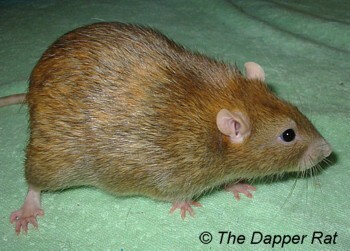 A hooded rat that has a coloured stripe on the belly. A berkshire that has a coloured stripe on the belly. This stripe covers the middle of the belly, so that you only see the edges of the white berkshire marking. The agouti DU belly stripe is light coloured (no dark guard hairs on the belly fur) but you can still distinguish the white berkshire markings to the sides of the stripe. 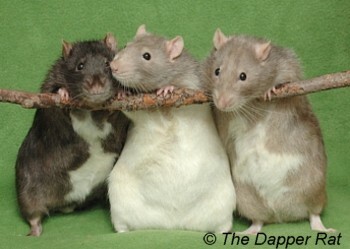 Note: More photos of each rat shown can be seen by clicking the rat's name. Many of these links show the rat's coat throughout their lives, from baby coats to old coats with various amounts of rusting. In many cases there's also links to other rats of the same colour to show you variations within the colour. A ticked coat appearing generally brownish grey with black guard hairs, with a lighter grey belly. Black eyes. Agouti is the colour most seen on wild rats. They can become rusted to brown and yellowish tones with age. A ticked coat appearing generally russet brown with dark guard hairs, and a lighter cream belly. Black eyes. A ticked coat with a distinct orange hue and a lighter cream undercoat and belly. Ruby eyes. Can be confused with cinnamon (the colours of both vary widely), but argente can be confirmed by the ruby eyes and lack of dark guard hairs. A ticked coat in a rich orange to ginger colour with a distinctive slate grey undercoat. Ruby eyes. Can be confused with argente as they can appear identical in colour, but topaz has a slate grey undercoat while argente has a creamy white undercoat. A pale apricot coloured coat that is evenly ticked with silver guard hairs. Pink eyes. A silvery brown coat, which can vary from a grey-blue to a warmer brown-grey. Black eyes. Often silvered. A pale silvery coat. Can vary widely from pale brownish grey to pale blue tones. Ruby eyes. Often mistaken for mink, but generally paler and can be identified as dove by the ruby eyes. A warm creamy off-white to pinkish-grey coat. Pink eyes. A pure white coat with pink eyes. Usually referred to as a PEW or Pink-Eyed White. A dark glossy coat, often more chocolatey than black. Usually silvered. Black eyes. Tends to rust in places to reddish brown tones. A slate grey-blue to pale grey-blue in colour. Black eyes. Sometimes confused with mink, but blue is distinctly grey-blue, while mink tends to be a warmer brown. Blue agouti is a similar colour, but with a ticked fur. 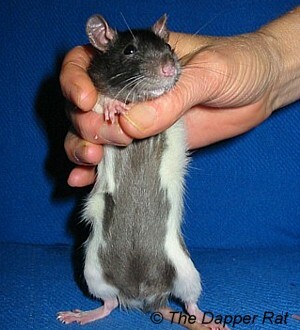 Baby coats: Rats do not grow in their adult coat until about 12-14 weeks of age. Before that they tend to have lighter coloured, softer coats and sometimes odd looking markings (e.g. minks often get lighter coloured diamonds on their heads as they moult). 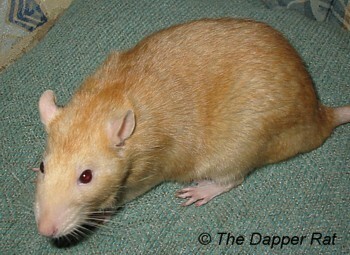 Unless you're experienced, it can sometimes be difficult to determine the colour of a rat before the adult coat grows in. Downunder: A marking that first appeared in Australia, which has a coloured stripe down the belly. 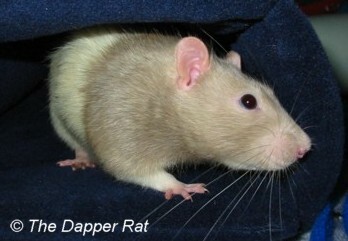 The DU marking can be seen on hooded rats and berkshires. 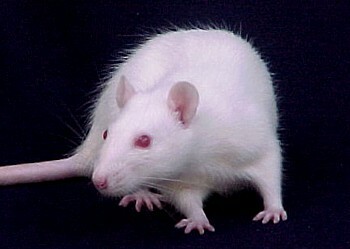 Eye colour: Rats can have black, ruby or pink (or red) eyes. Black and pink eyes are obvious, while ruby eyes often appear black until seen in the light. 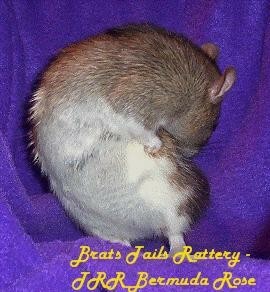 Guard hairs: The longest, thickest hairs in a rat's coat, forming the top (or outer) coat. Mismarked: Refers to a rat with imperfect markings compared to a show standard. Rusting: This refers to the coat colour becoming variable with age. Usually black rats will "rust" to a brownish red colour, minks tend to go brownish, white rats may go yellowish, and normally dark agoutis tend to lighten to brown or yellowish white. This usually occurs in variable patches, typically on their lower back and sides. Ticked: Colour type where each fur strand has several colours on it. e.g. agouti has grey, brown and black on each fur strand, making the rat's coat look peppered with colours rather than one solid colour. 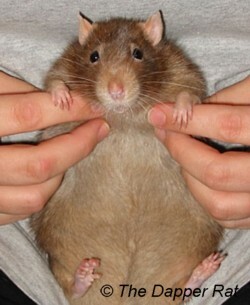 As the darker tips are not present on the belly fur, the bellies of ticked rats are lighter than the rest of the coat.